Sword Girls by ChangYou and Zeonix is a unique online card game that focuses on card aesthetics, building decks and duelling. Can you tell us more about the story line of this game? The core of Sword Girls revolves around four factions; Vita, Academy, Crux and Darklore. These factions contain a variety of unique personalities who eventually cross paths. Throw in a mysterious metal named talentium, used to craft mystical swords that can only be welded by select females and these encounters quickly become very interesting. The story is actually interwoven with history of the Sword Girls world and its current state. The details will be revealed through the flavor text on cards and our official website. Every new episode comes with a new set of cards, so pay attention! The details of the storyline will reveal themselves soon enough. The title of this game gives reason to believe to believe that the main characters will be girls. Can you tell us some about these leading ladies and how we encounter inside the game? We have such an ambiguous game title, how did you ever guess the main characters are girls… haha. These leading ladies have unique personalities, motives, and fighting styles that you will discover as you play the game. If you choose the Vita faction, Sita will be your main Character card. Sita is a soft-spoken warrior and specializes in damaging multiple enemy followers at once. You can also go with the Academy faction, where Cinia will be your main Character card. Cinia is a wealthy girl with many servants, and she specializes in cursing enemy Followers. Choosing Crux as your faction will feature Luthica as your main Character card. Luthica is a holy knight that fights for everything that is good and pure, and she specializes in supporting her own followers with useful buffs. Darklore is the fourth faction you can choose. The main Character card, Iri, is a vampire, and although she has more pure intentions than most of her kind, she’s just as vicious and deals damages to the enemy Characters directly. When we create our own character in Sword Girls, what options will be available to us? You will be able to choose between the four factions and their relative Character cards mentioned above to start out. However, you can mix and match different Character and Follower cards from any faction at any time! We also have a unique transformation feature for Character cards. By giving them gifts from your card collection, you can gain enough favor to transform your original Character card into their many unique alternate forms. Aside from the female characters, what other creatures and special characters could players have as part of their decks? Can you give us more information on the style, skills and other features some of the characters have? Aside from our female characters, we have MORE female characters! Actually, you can have three types of cards in your Deck: The Character cards mentioned earlier, Follower cards, and Spell cards. There are unique cards of every type, and their special abilities and synergies are too extensive to explain here. You’ll have to experiment and customize your own Decks to find out! The Vita Public School is an in-game school where we can find the card characters in the world of Sword Girls Online. Can you give us some facts about this place and what does it offer to students inside the game? The most important place you should definitely visit is the Science Lab. That’s where all the card crafting happens. You can also visit the Classroom, where your Follower cards can earn Training Points. You can also visit the Gym to upgrade and enhance your follower’s fighting power with Training Points. There are a few other places you can check out, such as the Library, the Campsite, and even a Cafe! One of the unique features of this game is the Card Crafting System. Can you tell us more about it? Crafting is definitely one of the highlights of Sword Girls. You can gain materials just from beating Dungeons and playing against other players, win or lose. Almost every card in the game can be crafted from materials gained through battle and from old cards you no longer use. How are players able to build their deck? Is there any in-game currency in Sword Girls? The one thing I dislike about card games in general is the initial investment of buying a starter deck and maybe even some boosters just to try my first game. We will give you a free starter deck of choice in Sword Girls. With the crafting system mentioned above, you have the ability to craft almost any card you need. The only currency we offer is Tokens, they can get you booster cards, starter decks and convenience features. You will never be forced to use Tokens at any point in the game. Sword Girls shows a fashionable and anime-inspired look on the cards. Who came up with the design for the cards for Sword Girls? This is what I personally respect and admire about Sword Girls. There are over 30 different veteran anime artists from Korea, Japan and even the US working on the card art, each bringing a unique style and personality. They put a lot of energy and detail into every art piece. They’re really something you can look at and appreciate. What are some of the interesting places and dungeons can we encounter inside the world of Sword Girls? Do they have effects on what kind of deck one is using? PvE through Dungeons will be one of the many activities players can engage in for Sword Girls. Every dungeon has unique opponents and bosses. Players will be challenged and encouraged to discover strategies for each Dungeons as there will be weaknesses, some more obvious than others. Gamers and new players are probably excited about events and wonderful prizes in their favourite game. Will there be any special events that we should all watch out for when the game goes live? One thing we want to build is our core community for Sword Girls. Doesn’t matter if you are coming for the artwork, the game play, or maybe just the great community, we will be giving everyone something special through our betas leading up to commercial service. Of course, we will also have other prizes for top players to earn. What are some of the best in-game features of Sword Girls which is something that you definitely recommend for all players to try at least once? Being able to adjust the game volume louder is awesome because I love the music, haha. Seriously though, browse through all the cards in the game. For one, you can see what cards you can craft and use with unique strategies. Secondly, you can enjoy all the alluring artwork. It’s a new game, but we’re starting with hundreds of cards, and we plan to add more on a regular basis. Sword Girls offers a one of a kind duelling experience. Can you tell us more on the gameplay and other exciting fighting experience that players should watch out for? I personally recommend battling through the PvE Dungeons first. They actually get very challenging and give sizable rewards. You can duel other players through our auto-matchmaking system, or take it casual and practice against friends. We will also be releasing Ladder mode if you are looking for something serious and bragging rights. Are trading and selling Sword Girls cards available in-game? There is no trading and selling in Sword Girls. Nothing is worse realizing you got the short end of a trade, or worse, scammed all together. We wanted to avoid some of the potential anguish for players, and instead of trading for needed cards, you can craft them. However, you will still be able to build own collection of cards. There is also an option to exchange materials and old cards you no longer use for more useful ones through Alchemy and the Exchange Office. Is there anything else you would like for our readers to know about Sword Girls? If you love anime or enjoy strategic game play, Sword Girls is definitely the card game for you. If you don’t love or enjoy either above, Sword Girls will be full of pleasant surprises still. 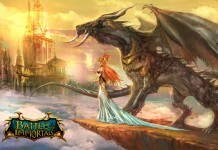 Next articleWar of the Immortals Closed Beta Key Giveaway! I love card games, and this game is really good,i like it’s concept.